The Eagle Iron Works were located at 401-405 E. 117th St., Manhattan, and they were also called Mugler's Eagle Iron Works. The New York telephone directory first listed an Eagle Iron Works at this address in 1904. The same directory listed A. Mugler, Eagle Iron Works at this address. A. Mugler was August Mugler (1877-?). According to a passport application filed in 1903, August Mugler was born 8 June 1877 in Dahn / Rheinpfalz, Germany. He emigrated on the steamship La Bourgogne from Germany 15 July 1890 and became a naturalized U. S. citizen 16 Dec. 1898. In 1918 August Mugler registered for the World War I draft when he lived at 1905 Davidson Ave., the Bronx. He was 41 years old and worked at his own iron business located at 403 East 117th St. He also registered for the 1942 World War II draft when he still lived at 1905 Davidson Ave., the Bronx. In 1942 he was 64 years old and declared himself "unemployed." In 1903 The Foundry. vol. 22, no. 132, August, 1903. p. 277, announced, "The Mugler's Iron Works, 420 East 108th St., New York, was recently incorporated to manufacture vestibule doors, elevator cars, bank and office railings, grates, iron stairs, fire escapes and other specialties." Mugler's Eagle Iron Works were located on East 108th St. from approximately 1900 to 1904. From 1908 to 1918 they were located at 841-843 E. 136th St. A Mugler's Iron Works coal chute cover is shown on the Mugler page. 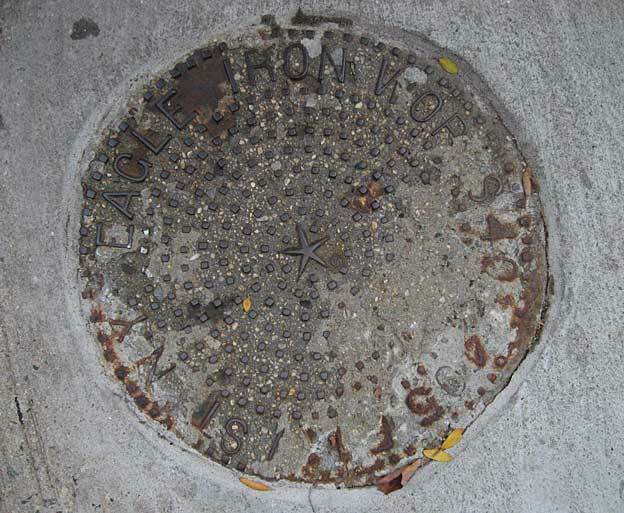 Other foundries in New York used the name Eagle Iron Works. These were primarily Cameron, Johnson & Radley on Grand St. from the 1850s until 1903, and Jacob May's Eagle Iron Works in Brooklyn on DeKalb Ave. The Brooklyn Eagle Iron Works were distinctly a separate and unconnected enterprise, and I have not been able to establish a connection between Mugler and Cameron, Johnson & Radley and their successors. Brief information about the firm, Cameron, Johnson & Radley, is available on the Cook & Radley foundry mark page. August Mugler continued to be the proprietor of the Eagle Iron Works and the Eagle Building & Construction Co. at 401-405 E. 117th St. until the mid-1920s when these companies moved to 212-216 E. 119th St. In the late 1920s Eagle moved to 830 Williamsbridge Road in the Bronx. A story in the New York Times (2 Oct. 1932) about property tax reductions during the Depression, listed "Mugler, A., 830 Williamsbridge Rd." among some of the larger personal property assessments in the Bronx. The assessment was for $100,000. The last listing for Mugler's Eagle Iron Works in the New York telephone directory was 1928. This ad for Mugler's Eagle Iron works appeared in Polk's New York City Directory for 1916. The address at that time was 401-405 E. 117th St. (corner of 1st Ave.). Another well-known Eagle Iron Works were the Eagle Iron Works founded by William Philip Abendroth (1818-1898) and Philip Rollhaus (1807-1883) in 1840. This company known initially as Abendroth & Rollhaus (1840 to 1845), then later as Abendroth Brothers, maintained a foundry in Port Chester, N. Y., and offices at 109 Beekman St., New York City. They were in business from 1840 to 1920. William Philip Abendroth was born in Hesse-Darmstadt, Germany, immigrated to the U. S. in 1832, apprenticed with the foundry of Ephraim Nott in Albany, N. Y., and New York City, and formed a partnership with Philip Rollhaus in 1840. William Abendroth's brothers at Abendroth Bros. were Augustus A. Abendroth (1822-1881) and John W. Abendroth (1825-1897). Dun's Review wrote as follows regarding Abendroth Bros. in 1904, "One of the oldest and largest manufacturers of coal, wood and gas ranges, cast iron soil pipe and fittings, and steam and hot water boilers in the United States is the firm of Abendroth Bros., 109-111 Beekman street, New York City, who operate an extensive plant at Port Chester, N. Y. For sixty-four years this firm has been steadily building up a reputation that now encircles the globe, and shipments are made to all parts of the civilized world. The manufacturers claim that the words "Abendroth, N. Y," on cast iron soil pipe or fittings are equivalent to a guarantee of highest quality, and for many years Abendroth Bros. have been regarded as one of the foremost independent manufacturers of cast iron pipe and a complete assortment of pipe fittings." A beautiful photograph of the east side of Manhattan in 1906 is available on the internet at http://www.shorpy.com. This shows a sign reading Abendroth Bros. / Stoves & Ranges / for Export Trade. This view by the Wurts Brothers in the New York Public Library's Digital Galery shows the identical sign and gives its location as Beekman St. near Pearl St.